Should you ever find yourself stuck on the roadside because of an automobile breakdown, or stuck in the mud in Red Hook Brooklyn, you’d better call the boys at Ben & Nino Auto Repair. Ben & Nino will respond fast with dependable, high-quality service any time of the day or night. When you call Ben & Nino, you’ll get a real person on the line, not an answering service. Ben & Nino’s drivers will tow you to your destination, wherever in Red Hook Brooklyn that may be. Ben & Nino deliver dependable service and competitive prices. If you haven’t got a place to park, Ben & Nino can store your vehicle for you. Your car or truck will be stored at the secure on-site yard. The drivers at Ben & Nino Auto Repair are fast and friendly. 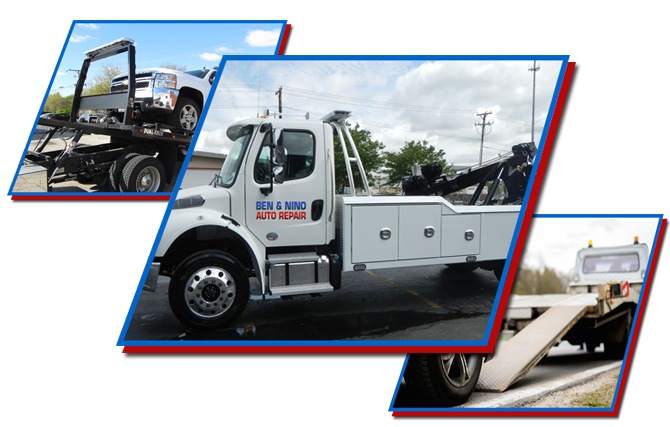 They will work with you to get you parked or repaired safely.Ben & Nino Auto Repair’s rapid response towing and 24-hour roadside service in Red Hook Brooklyn sets them apart from other Brooklyn towing services. When they won’t jump a battery of change out a tire, the boys at Ben & Nino will! Whether it’s 4 p.m. or 4 a.m., they respond 24 hours a day to deal with any roadside emergency. From battery jumps to lockouts, to pulling you out of a sticky situation, Ben & Nino Auto Repair can handle it. Anytime you need fast roadside assistance in Red Hook Brooklyn, call Ben & Nino at (718) 339-8500 and they’ll give you a hand!